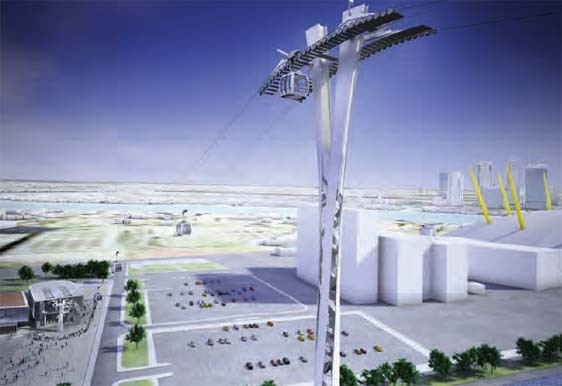 Planning applications have been submitted to Greenwich and Newham councils by Transport for London for the construction of a new cable car system across the Thames. The new scheme would provide a new direct transport link between the O2 and the Royal Victoria Dock, carrying up to 34 gondolas over 50 metres above the Thames. Each gondola will be able to carry up to 10 people, creating "improved improved cross-river connectivity for pedestrians and cyclists". The scheme, which TFL believe will become a "visitor attraction in its own right", consists of a station in North Greenwich, a station at Royal Docks and a number of steel towers with the two main towers both rising to about 85 metres in height. 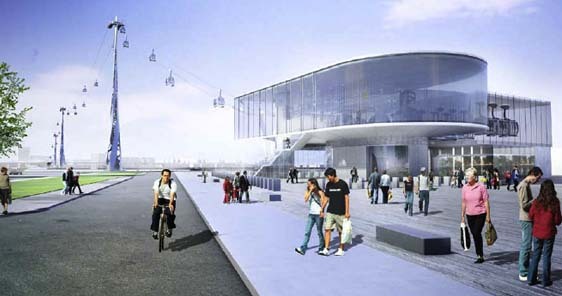 The station at the Royal Docks would be the "drive station" where the system's electric motor is housed. The Greenwich station would be the "return station" and also home to the gondola garage. TFL are proposing that the Greenwich station be built a few hundred metres from the O2 on hard standing that is currently used for visitor coach parking. The cable cars, considered to be "one of the most reliable forms of public transport in the world" according to the planning application, could be in operation by the time of the London 2012 Olympics. A fare structure has not been devised yet but TFL plan to integrate the cable cars into the Oyster system and are forecasting suggested single fares at £2.50 for Oyster PAYG users and £3.50 for other users. When news of the scheme first emerged in July, Nick Raynsford MP told Greenwich.co.uk that the scheme was a “nice little project” which would be good for tourism, but it wouldn’t address the “much wider problem” of the “absolutely hopeless cross river links” in the area. I am still not sure if this is a very late April Fools. Is this really going to be a profitable venture ? Will anyone use it after the Olympics? It only goes as far as the Royal Docks anyway. Surely what we need are proper river crossing such as a reliable blackball tunnel or even better an actual bridge ? it’s for free and tourists as well as some londoners will use it. LX – it won’t be free – it would be integrated with the Oyster card, according to Londinist. LOL – look at the usual fantastically unrealistic graphic designer’s visualisation in the first picture – the north bank of the Thames resembles the moon or the Arizona desert. Like most people, I usually support anything that brings improves transport links and brings investment to Greenwich, but this appears a predicatable white elephant. Unlike the dome it doesn’t have umpteen uses after it original purpose; it will be fun for a while but then commuters will use the considerably faster options of tube/dlr. For tourists, once the olympics are forgotten it won’t be worth a trip from central London for: it won’t go anywhere particularly interesting and would need to be somewhere around tower bridge really. As much as I would enjoy riding on it for fun, scarce resources designated to improve transport could be better spent on other improvements. Well this looks fun and a good way to get masses across the river. Um…until you consider that there won’t be any extra buses laid on to get people back n forth from the O2. I was told this at the stand that was put in place at the O2 over the summer to consult local residents and this was the first thing I asked about. There is zero extra capacity on those buses in rush hour so how will the rest of these people come and go? Presumably in designing the system they will take account of the height of the large cruise ships and what remains of our Royal Navy that regularly visit Greenwich during the year. Another foot tunnel, with travelators, might be more appropriate. @Indigo: By “it’s for free” I meant the construction and maintenance. So Londoners or any Brits won’t have to pay for it in any kind. Of course if you want to take a ride: you’ve got to pay. Well: another fancy theme park addition for London. Kensington skywalk, London Eye, this disgusting Orb and now a tiny cable car with 85m towers. The city also got a gherkin, a shard. Hmmm next should be a rollercoaster and a waterslide from Soho to Camden. Why not? 😉 And please: sun-and-rain-covered moving sidewalks which give the impression to users like surfing (with integrated solarium). Man, it will be great! On or about 17 January 2011 until 31 March 2011, as part of the GLA project to erect a Cable Car across Bugsbys Reach in the vicinity of Blackwall Point, a borehole survey will be conducted from about 150 metres below the bottom of North Greenwich Pier, across the river to Alexandra Wharf, by Victoria Dock Barge Roads Lower mooring. Thanks for sharing the info, xyz – much appreciated.